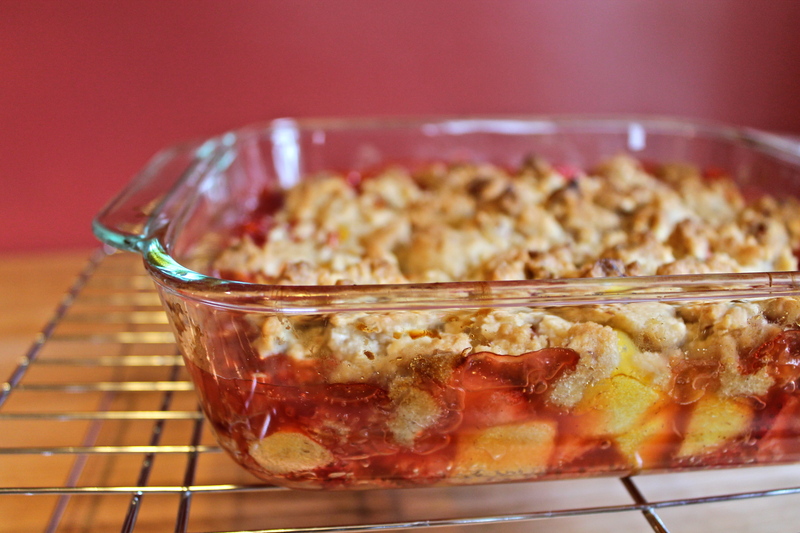 I’ve been sitting here for what seems like an eternity, trying to figure out the perfect explanation for why this fruit crumble has risen to the top of my list of Greatest Summer Desserts. After a lot of false starts and deleted sentences, I can only seem to explain my love by stating this: this is a crumble that tastes like fruit. It does not taste of unbearable sweetness, it does not taste of leaden crumble topping, and it does not taste of overwhelming spices floating about in a pool of syrup. It tastes like fruit. It is odd that I find this attribute to be so remarkable? I’ve made dozens of fruit crumbles, crisps, and cobblers in the past, but none of them have hooked me in the same manner. 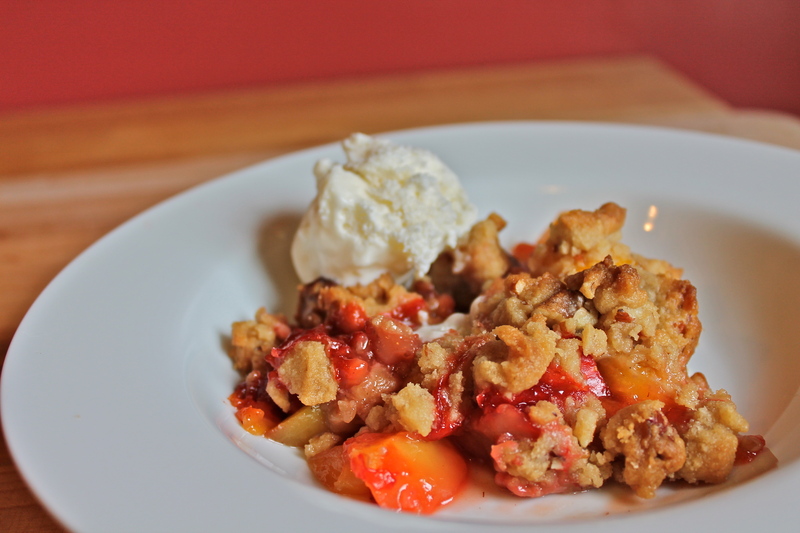 Maybe it’s due to my newfound realization that most desserts are simply bogged down by far too much sugar, but when I took my first bite of this crumble and was struck by how much it tasted like fresh mangoes and ripe strawberries, it was almost as though a light went off in my head. 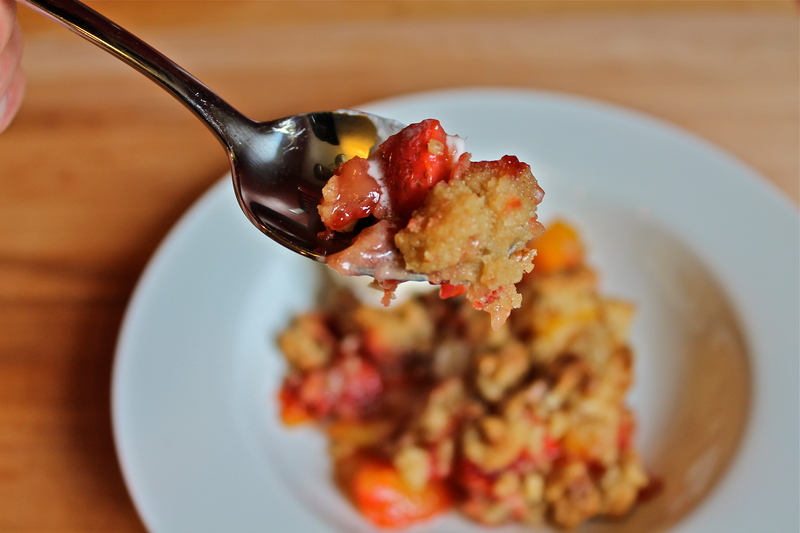 A fruit crumble that tastes like fruit? This is a revelation. Okay, it’s possible that I am overstating things. Perhaps highlighting the fruit in a fruit dessert is not the most Nobel-worthy of actions, but you’ve got to get on board with what I am touting here. 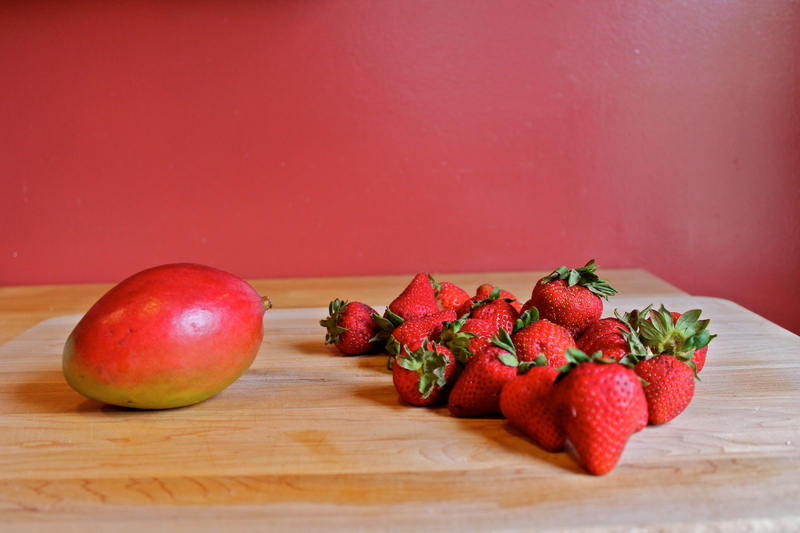 Think mangoes and strawberries, spritzed with lemon juice, barely sweetened, and sprinkled with just a hint of spices. Then crumble on a nutty, lightly spiced topping and bake everything together until it becomes juicy, crisp, and absolutely delightful. You can add a petite scoop of ice cream (in this case, a frozen concoction of leftover lemon cream and a bit of unsweetened heavy cream that, good lord, made the fruit sing even more than before), or you can eat it as is. Just make sure you do eat it because, trust me, this is a dessert you don’t want to miss. 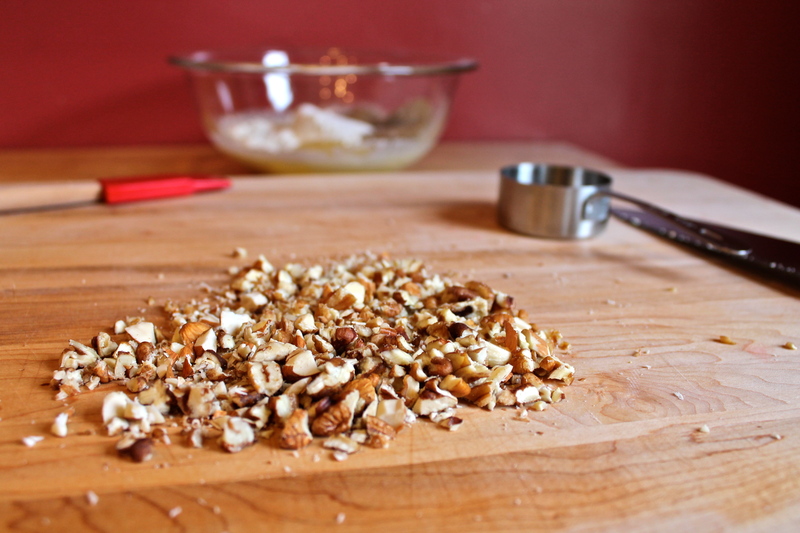 To prepare topping, in medium bowl combine flour, granulated sugar, dark brown sugar, nuts, pinch of salt, and spices. Using a fork, stir together until ingredients are fully combined. Drizzle in the melted butter, then stir until butter is evenly incorporated. Set aside mixture to firm up just a bit. 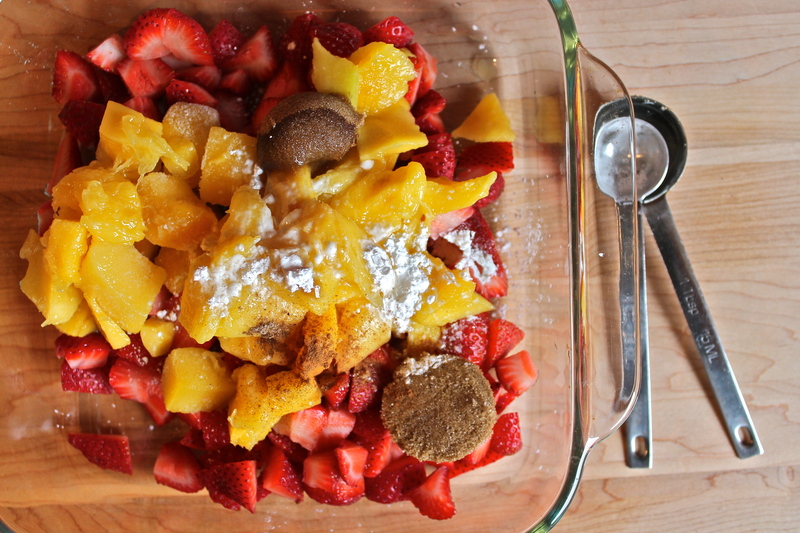 In an 8” by 8” baking dish, combine strawberries, mangoes, 1 tablespoon dark brown sugar, cornstarch, lemon juice, and pinches of cinnamon and cardamom. Toss together and make sure that the fruit is evenly coated with the sugar and cornstarch. 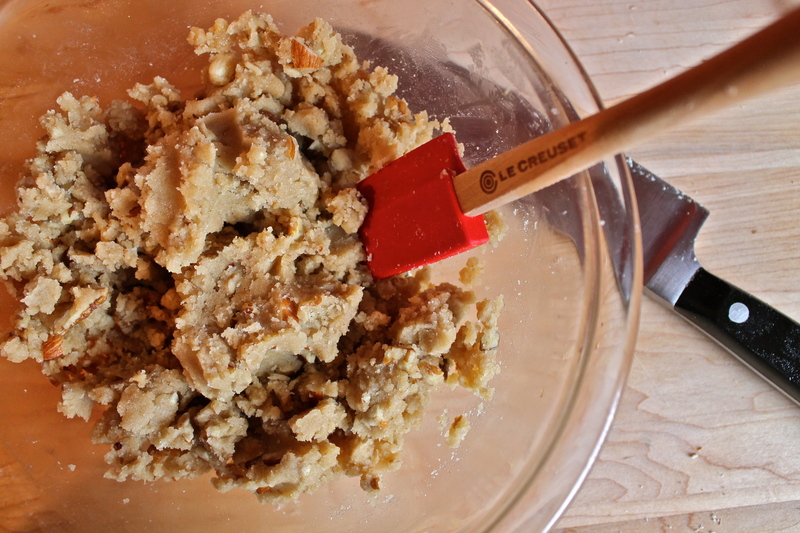 Using your fingers, pinch off 1-inch to 2-inch pieces of crumble topping mixture and evenly scatter them over the fruit. 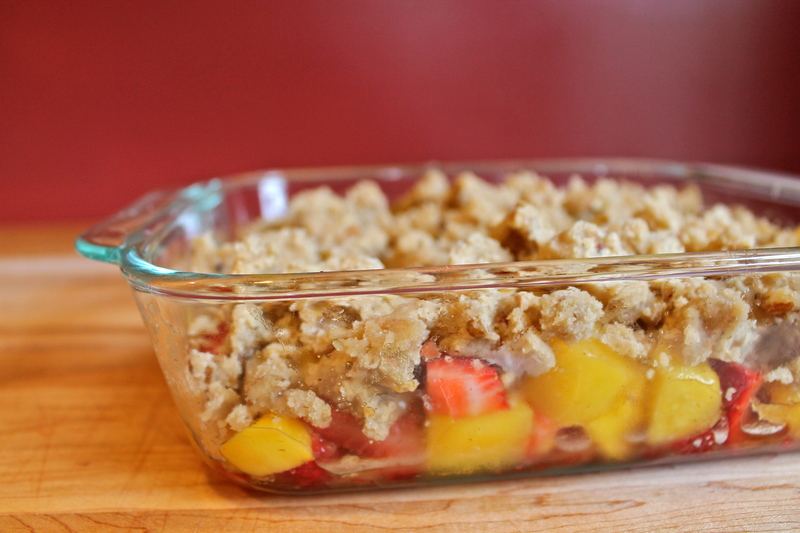 Bake crumble in the center of the oven for 30 minutes, until the fruit is bubbling and the crumble topping is nicely browned. Allow to cool for at least 15 minutes before serving, lest you scorch yourself with the molten lava-like heat of the fruit. Serves 6 to 8, depending on the generosity of your servings. 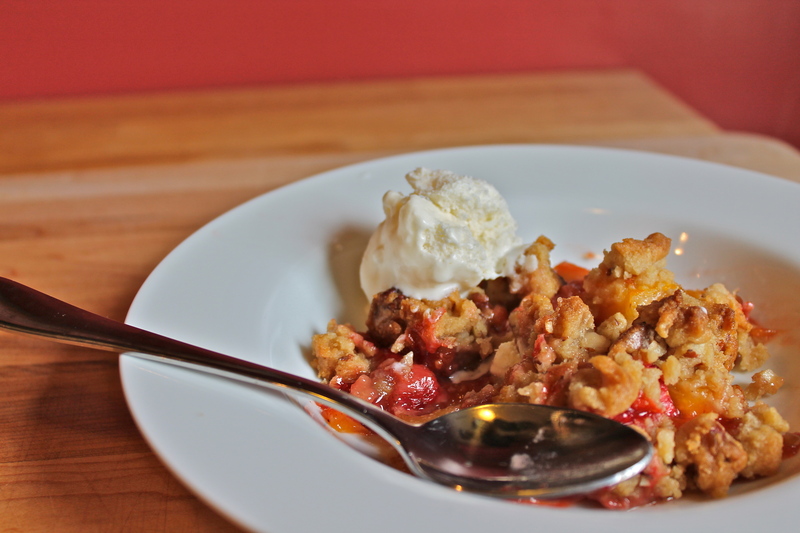 I love a crumble– so low tech, unadulterated, and juicy!